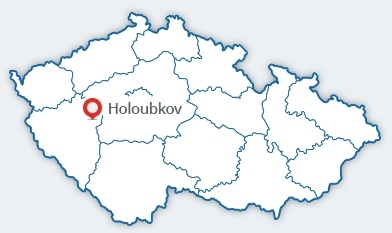 History | DCK Holoubkov Bohemia a.s. The company was established on 23 February 1953 by being hived off from the Cooperative of Concrete Producers Prague to focus on the production of concrete prefabricates. In the 1960’s, manufacture of thin-walled concrete low-voltage switchboard cabinets developed in the company as the core scope of business. To maintain company competitiveness, two pressing shops were constructed and equipped gradually for the production of switchboards by polycarbonate injection moulding and SMC hydraulic pressing. As for the legal status of the company, the legal form was changed on 1 June 2002 from “producer cooperative” to “joint-stock company”. The majority shareholders of the company are 3 natural persons, each of them holding an equal share of 33% in the company. The key accounts of the company are predominantly the power distribution companies of the Czech Republic and whole-sale organizations in electrical installation materials. All company products are manufactured at a comparable global quality level and certified by EZÚ Prague. Several technical designs of the company products are protected by means of utility models and patents.